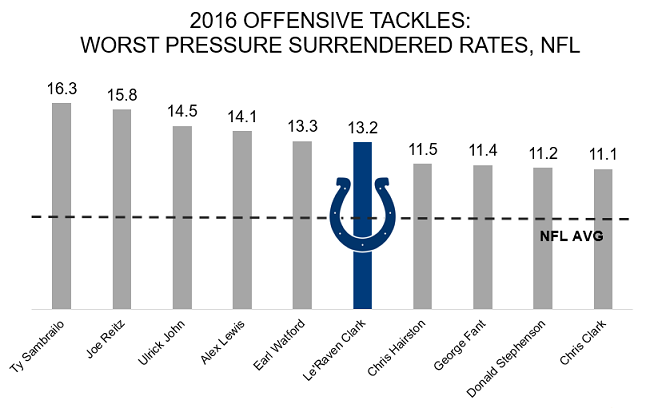 Second-year tackle Le’Raven Clark has been working with the first team for the Colts at right tackle during OTAs. The third-round draft pick in 2016 saw three starts there to end his rookie season, amassing 117 pass-blocking snaps over the year. Clark was beaten for just one sack in those three starts, but surrendered 14 total pressures, or a pressure once every 8.4 pass-blocking snaps, one of the worst rates in the league, continuing a trend of pass protection struggles from his college starts. Clark’s run blocking was far stronger, with his PFF grade of 78.6 ranking 27th among all tackles.